Boasting spacious units behind the tastefully restored facade of a near-century-old church, Sunday School Lofts is coming to Riverdale. The 32-residence four-storey condo community is the latest project from Grid Developments, a merging of Aykler Developments and Urban Fabric Developments. 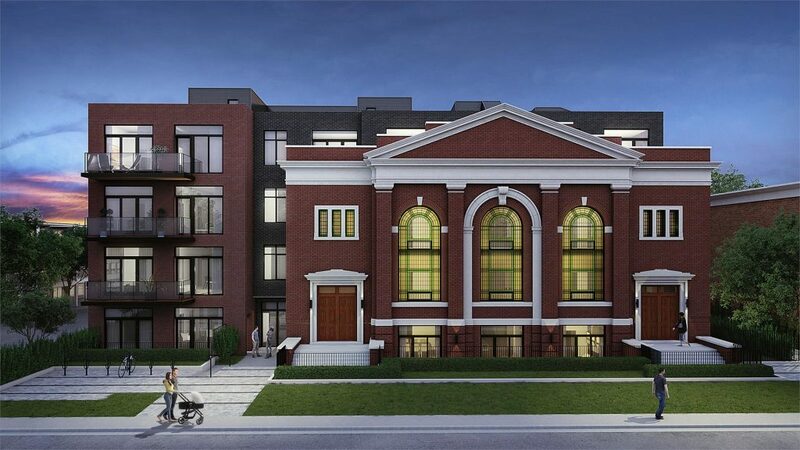 As with the builders’ previous projects, such as East Village Leslieville, Steam Plant Lofts and Leslieville Lofthouses, this new community offers a particularly family-friendly mix of suites in a desirable east-end neighbourhood that’s teeming with amenities. Twenty-seven of the residences at Sunday School Lofts include two or more bedrooms, and most penthouses offer two large terraces providing generous outdoor space. Along with a high share of multi-room units, the community has a larger-than-usual average suite size of 1,033 square feet. Currently in the pre-construction phase at 14 Dewhurst Boulevard — a quiet, tree-dotted side street just steps from Danforth Avenue — Sunday School Lofts is only a short walk from both Pape and Donlands subway stations. Due to its proximity to Danforth Avenue, it should come as no surprise that the community’s address earns it a high Walk Score of 96, meaning day-to-day errands don’t require a car. Indeed, there are scores of cafes, restaurants and retailers within minutes of Sunday School Lofts. The heritage-tinged development draws off the Temple Baptist Church’s facade by carrying on the timeless red-brick treatment of the latter, but with modern touches like glass balconies. A full-sized two-bedroom model suite is in the works at the Temple Baptist Church site, and it is expected to open this fall. Already, Sunday School Lofts has been well received, having racked up more than 800 registrations ahead of its official launch. To keep up to date on the latest Sunday School Lofts news, register at sundayschoollofts.com.